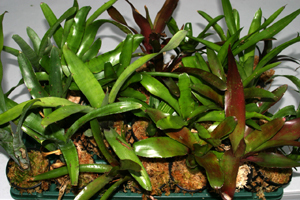 Chosen from a variety of species and hybrids of Neoregelia, Guzmania and Vriesea. All are smaller growing types suited for terrarium use. Photo indicates a random sampling of the varieties that may be included. Our choice, price is per pup.